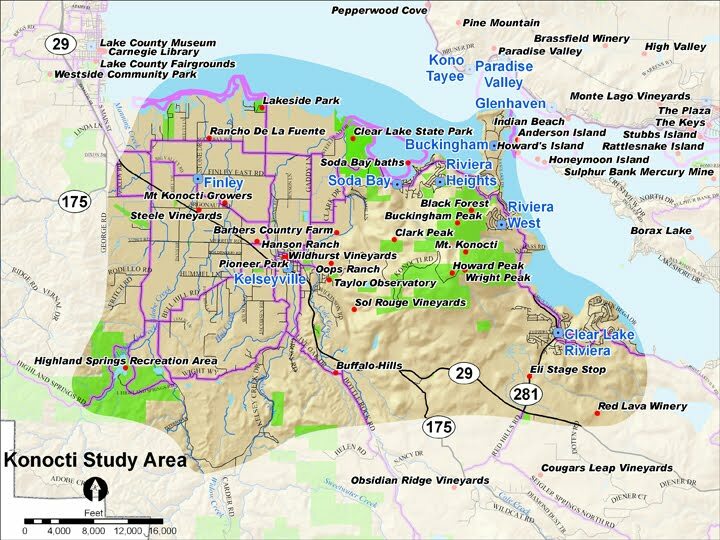 CL State Park to Kelseyville via Kelsey Creek: issues with easements, follow the creek out of Kelseyville; clean up the mess around Kelsey Creek; All Riparian corridors blue lines on maps might be way to connect areas. Would be great demand for this. State Park is a big draw so making connectors from here is a good idea. Mt Konocti from Soda Bay: There is an existing trail on top of Riviera Heights that may be a good way. Potential issues with homeowners, traffic, parking. Also a trail in Riviera West same issues as above. Mt. Konocti: There is a need for connecting routes from here and all that have Konocti in it. Start at the top and figure out how to get down. Old trails on topo maps that are now overgrown that can be identified and reclaimed. Use Google Earth. Can ultimate plan have both “low hanging fruit” but also prioritize trails if all was in the ideal? What is the easiest to identify and get going on now. Get the main ones done before you can expand out. This is citizen designed and citizen driven. From county stand point trails on the mountain. From a citizen standpoint will take the opportunities presented. Looking for carriage-friendly trails fairly level and fairly wide. Clarke Drive has carriages right now. Identify points of interest on all trails – for instance huge grave marker/stone from former resident on Konocti. Next step is to get volunteers. There are 100 trail possibilities. Call schools, set up an email list where local trail project needs can be advertised so that the entire community of Lake County trail junkies can spawn. Maintenance and patrolling must be built in. Bikers, docents, scouts, etc. State park to Kelseyville is high priority.